Is your cat a true gourmet but prone to hair ball formation? 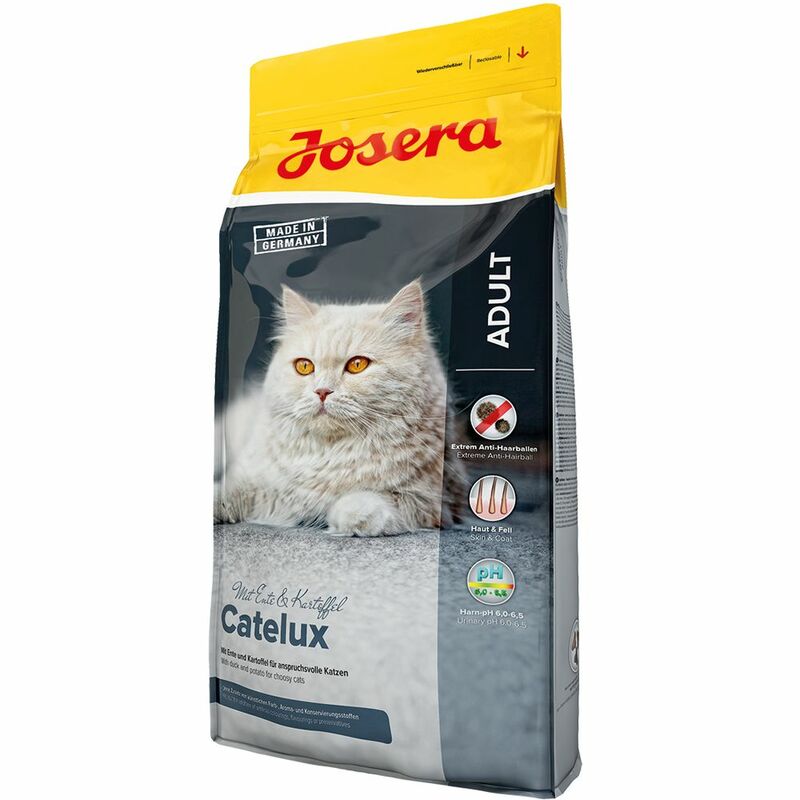 Josera Catelux cat food is made with tasty duck and potato and is perfect for the choosy cat. The delicious, balanced recipe contains special dietary fibres which support the transport of swallowed hairs through the digestive tract. This can help to reduce the development of hairballs. It can also have a positive effect on skin and fur. Josera Catelux meets the nutritional demands of picky cats and those which tend to swallow a lot of hair which forms hair balls. Catelux is gently proceΒed using premium quality ingredients and important antioxidants. It is easy to digest and well accepted. Josera Catelux comes in re-sealable pouch so your cat can enjoy a portion of fresh food every day. Ideal for choosy cats: delicious duck and digestible potatoes Hair Ball Formation: Especially long-haired cats swallow a lot of hair during their daily grooming seΒions. Josera Catelux contains special dietary fibres which counteract the formation of hair balls. These fibres help to move the swallowed hair through the digestive tract. Skin and Fur: A nutrionally balanced diet promotes a shiny fur and healthy skin. eΒential fatty acids, vitamins, and organically bound, easy to absorb zinc and copper have been added to aid healthy fur and skin from within. Urinary pH values: Josera Catelux is made to a special recipe using carefully selected ingredients. This ensures a balanced calcium-phosphorus ratio and a reduced level of magnesium to encourage optimal urinary pH values of 6.0-6.5 which can reduce the risk of urinary stone formation. Josera stands for certified, premium quality from the Odenwald area of Germany. Their cat food has been developed based on the findings of scientists and veterinary specialists. It is carefully proceΒed using only environmentally friendly methods. Josera cat food is available in different formulations to suit your cat's individual needs.